Sorry the post is a bit late, I had some technical difficulties but it’s okay now! After having an okay summer of reading, I want Autumn to be better. So many books have either just been published (David Mitchell’s The Bone Clocks) or are about to become films (Gone Girl and The Maze Runner) and some are just pretty damn fancy (Burial Rites). From Thriller to Romance, Young Adult to Dystopian, this season I hope to broaden my reading horizons with some great new books. Gone Girl Now this book I am actually half way through but I wanted to include it for two reasons. One, it is coming out in cinemas on 2nd October so I wanted to read it before it was released, and second, I freakin’ love it! Expect a review when I am finished. UPDATE I have finished this, hated it! Saw the film though and really enjoyed it – expect a comparison soon! The Maze Runner I thought why not talk about the ones I have mentioned above first? You may or may not know that I am a lover of all things dystopian – I loved The Hunger Games trilogy, Divergent both the trilogy and the novellas, loved the first of the Shatter Me Trilogy, and also Brave New World – that one was just amazing I have nothing else to say about it. Being another book that film is being released at the start of October (the 10th to be precise) I thought I should read this too as I hate watching films before reading the books! UPDATE I have now read this and loved it! The Bone Clocks Ghostwritten was the first book I read this summer that I actually loved! I wrote a review here if you would like to know a little more about it. When Mitchell’s novel was released on 2nd September I went straight onto the foyles website and purchased the limited edition with the turquoise pages. Can we also take a moment to appreciate how snazzy the cover is, I am loving that! Burial Rites Based in Iceland, this story is written about the last public execution. Is that not enough to draw you in? I can’t wait to get my head wrapped into this story. Panic I had heard about panic after seeing Fleur’s picture on instagram showing the cover. Now I know you aren’t meant to judge a book by its cover, but this one looked so interesting. 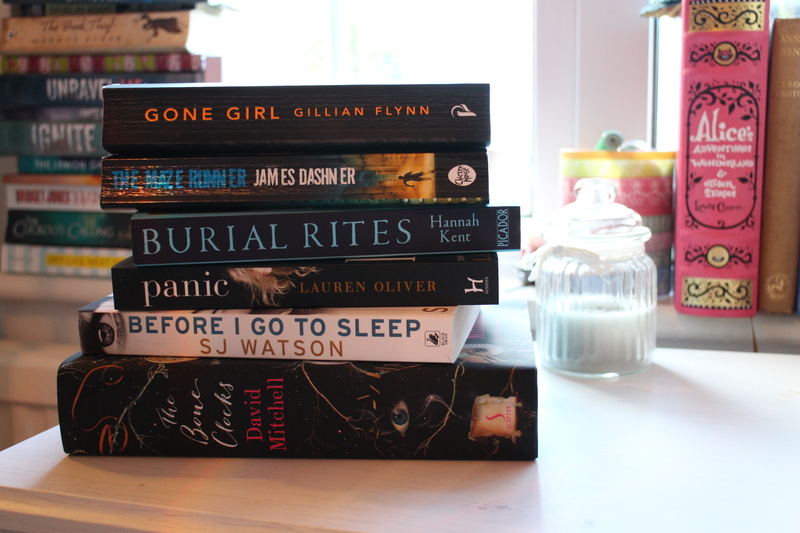 Anyway, when I was in Tesco the other day they had an offer on books (2 for £7) and Panic was one of them. I read the back and quickly put it in my basket. Before I go to Sleep Yet another book which is a film, however this film is already out. This is the other book I got on Tesco’s offer and I cannot wait to sink my teeth into it. The Road This book has been out for a while, but we started reading it in Creative Writing last week and I was drawn to it! No clue what it’s about – if you know then comment below! There is a film of the same name. Have you read any of these books? If you have, let me know what you thought by commenting below.